At this point Wansdyke finally goes its own way, diverging from the Roman Road. In fact, the builders of Wansdyke were so keep to block the road that they dug right through it at the point where no other route could be followed. By car from Swindon. Follow the A 4361 to Wroughton and on to Avebury. You will drive right through the ancient Stone Circle and a visit can only be recommended! Drive to Avebury through the roundabout, then take the A 4 to Cherhill (there's a nice White Horse on the hillside to your left), and on to Quemerford. Take the first road left right before the town, which will go to Devizes. Drive on to Smallgrain Plantation, where there's a golf course south of the remains of the Roman Road, but just before that you pass a picnic site. Best park the car there, and walk back on foot to where the signs show you the Wansdyke Path going right, which will lead you to Morgan's Hill. By car from Calne and Chippenham. Follow the A 4 to Quemerford. Take the road right when you leave the village, then continue as described above. By car from Devizes. Follow the A 361 to Avebury and Swindon, but after you passed Bishops Cannings, take the first road left. The first crossing after you've passed some cottages (but continue on!) will be the Old Bath Road, the medieval alternative of the Roman Road. To your left is the 1643 Civil War battlefield of Roundway Down. When you passed the golf course, you'll reach a picnic site. Best park the car there, and continue as described above. Alternatively, if you don't mind a good walk, continue to Shepherds' Shore, where may park the car (remember it's a private farm!) and enter the ansdyke Path going left, which will take you all the way across Morgan's Hill. 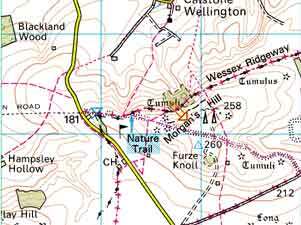 click here to return to East Wansdyke, section 7.